The number one problem requiring oral health care is periodontal disease. Early intervention is the key and this requires professional help. To properly evaluate an oral cavity and provide proper care the animal must be anesthetized. It is impossible to deal with any problems in the back of the mouth or on the inside next to the tongue in an awake animal. While ANY effort to keep the teeth clean is a plus, the reality is that anesthesia is mandatory to perform a complete dental prophylaxis. The idea is to thoroughly clean above and below the gumline, smooth the enamel surface, and improve the structure of the enamel layer. The time required will depend on the amount of disease present. Animals with minimal disease may take up to 30 minutes to perform the dental prophylaxis procedure. Animals with severe disease may take several hours of anesthesia time and may require several visits to get the disease under control. Unfortunately many animals hide their disease and the extent is not discovered until the animal is asleep. Advanced periodontal disease usually results from the effects long term dental plaque accumulation. The implications for the animal's health can be severe in that severe periodontal disease can worsen existing kidney or heart problems. The bacterial toxins absorbed into the body tax the animal's health and create a feeling of general illness. Many animals that have their mouths returned to health become active and playful again (giving their owners lots of guilt for not doing the procedure earlier!). Periodontitis is a destructive inflammatory process of the peridontium driven by bacterial plaque containing specific bacterial species that cause destruction of the gingiva, periodontal ligament, alveolar bone and root cementum. In animals periodontitis is considered a progressive disease with intermittent active episodes. In man gingivitis and periodontitis may be two separate diseases. As periodontitis progresses the attachment mechanism is lost allowing deep tissue invasion of microorganisms into the supporting structures resulting in periodontal ligament and alveolar bone loss. In the final stages the tooth becomes mobile and is lost. Of clinical significance is the type of bone loss occurring adjacent to the tooth root. Horizontal bone loss is characterized by simple resorption of bone parallel to the cejs involving adjacent teeth and remaining crestal bone supporting normal periodontium. (The cej is a landmark on the tooth where the enamel stops and the cementum [or root] starts, and if you draw a line connecting all the cejs it will be almost a straight line. The plane of horizontal bone loss is parallel to the cejs.) Vertical bone loss is characterized by maintenance of crestal bone height with loss of periodontal ligament and supporting structure adjacent to the tooth root. Horizontal bone loss usually has minimal "pocket formation" whereas vertical bone loss has huge "pockets" requiring surgical intervention. Periodontal disease is caused by bacteria. Pockets cannot form in the absence of bacteria. Some of the pathogens have been identified; they are mostly gram negative anaerobic motile rods. The pathogens probably cause the disease. On a percentage basis the number of aerobic bacteria decrease and anaerobic bacteria increase as the disease progresses. When evaluating the microbiology in a diseased mouth anaerobic cultures are indicated since aerobic cultures tend to be nonproductive. Periodontitis can be characterized by the cardinal sign of destruction of the alveolar bone. The features include conversion of junctional epithelium to pocket epithelium, and destruction of the connective tissue matrix of gingiva and periodontal ligament. Histologically periodontitis is characterized by several stages and closely resembles a typical humoral immune response. Most veterinary dentists refer to a staging system when characterizing an animal's mouth. Because periodontitis is usually progressive, staging allows for improved record keeping and treatment planning. None of the stages is totally unique and therefore a great deal of variation can occur in an animal's mouth. 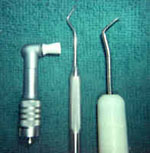 The author uses a six stage system for adult periodontitis. Stage 1 is gingivitis. Stage 2 is chronic gingivitis that does not progress to periodontitis. Stages 3 through 6 are periodontitis characterized by attachment loss from minimal (3) to maximum (6) and tooth loss. Obviously Stage 5 and 6 animals will require aggressive "rocket science" therapy to maintain teeth while Stage 3 mouth will require standard periodontal therapies. Periodontitis can be localized or generalized. When generalized the staging system is an average of the teeth involved (i.e., Stage 5) or a range (i.e., 3/5). When localized the specific teeth are mentioned; i.e. #108 stage 5, # 208 stage 3. Regardless, record keeping of disease is becoming the standard and if not done voluntarily the judicial system will dictate it. Treatment planning for adult periodontitis is based on the stage of the disease. For generalized periodontitis the following treatment plans are suggested as guidelines for therapy. Obviously, the success of any treatment plan is based on the cooperation of the owner, animal and veterinary dental team. Any breakdown in this equation spells failure. Once the procedure for each visit is complete, accurate charting of the animal's mouth is imperative. Without accurate record keeping, success or failure of treatment will be impossible to determine. The Triadan Number System is computer compatible and is suggested as the system of choice. Individual charts are based on personal preference. Small Animal Dentistry by Harvey and Emily has several excellent dental charts for inspection.